After the success of the original Egg 150 monitoring system, there was a lot of talk about a smaller and more affordable version, and finally the ‘mini’ Egg 100s have arrived. Design and manufacturing are handled by Munro Sonic, a new company set up to develop professional loudspeakers and electro-acoustic products. The main players are well-known acoustician and speaker designer Andy Munro, and James Young and Phil Smith, owners of Sonic Distribution. The Egg 100 concept is broadly the same as that of its larger sibling (or should that be hatchling? ), other than the use of passive rather than active crossovers. To reduce the air volume needed within the Egg, there’s a pre-crossover EQ and an electronic high-pass subsonic filter to allow the most output from the critically tuned cabinet without risking overstressing the bass driver. This is achieved by means of an active control unit, which ships with every pair and is required for operation. As you’d expect, the enclosure is a little smaller than that of the 150s, at around 300mm tall. This time it houses a 100mm mid/low driver, plus the same one-inch soft-dome tweeter used in the Egg 150s. Both drivers are recessed into the flat baffle area at the front of the enclosure. The external two-channel amplifier pack provides the necessary power, and the crossover is a two-way passive circuit built into the speaker cabinet. The monolithic amplifiers are rated at 50 Watts each, but they are run at a lower rail voltage to limit them to around 30 Watts. This allows the amplifier to clip before the speakers are able to run into their danger zone. The front-facing LEDs that were fitted to the Egg 150s and intended to make ‘aiming’ them easier are absent, but in most other respects, these speakers just look like smaller versions of the 150s. 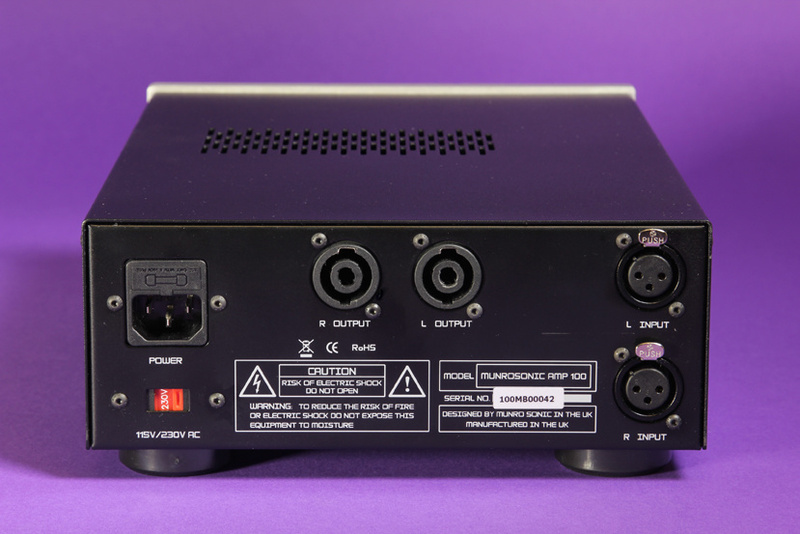 Physically, the amplifier/controller, which uses all-analogue circuitry and a linear power supply, is also smaller than the unit supplied with the Egg 150s, as it only has to house two amplifiers rather than the four of the Egg 150s, and has fewer front-panel controls. Just under 230mm wide, it still features a generously thick aluminium front panel with a large volume knob to the left, a power button in the centre and a headphone jack on the right. Audio input is via a pair of rear-panel XLRs. Putting the amplifier pack outside the speaker cabinet virtually eliminates the effects of vibration on the electronics, it reduces heat build-up inside the speaker enclosures, and it puts the controls in a more ergonomic location, so it makes a lot of sense. The other main reason for doing this is to avoid the amp intefering with the internal form of the specially designed cabinet. Independent LF and HF trim pots for the left and right channels are provided; these are recessed into the left side panel and accessible using a small screwdriver. 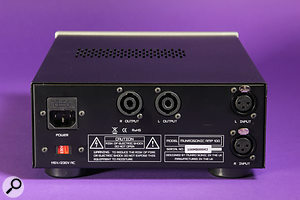 An LED headroom indicator is fitted to the front panel above the power switch, and a pair of heavy-duty 1.5-metre speaker cables terminating in Speakon connectors is included. The auxiliary input and mid EQ of the Egg 150s’ controller has been omitted, hence the more sparse front panel layout. A blue ring around the power switch illuminates when it’s powered up. The headroom indicator flashes when either of the power amps gets within 2dB of clipping, and the HF driver is fitted with a self-resetting thermal fuse. Going back to that egg-shaped cabinet for a moment, despite the fact that it is now available in a choice of black, white or red, it isn’t simply a fashion statement. The well-damped monocoque moulding that makes up the enclosure has great inherent strength, there are no parallel surfaces to encourage resonant modes, and there are no sharp cabinet edges to cause sound diffraction. 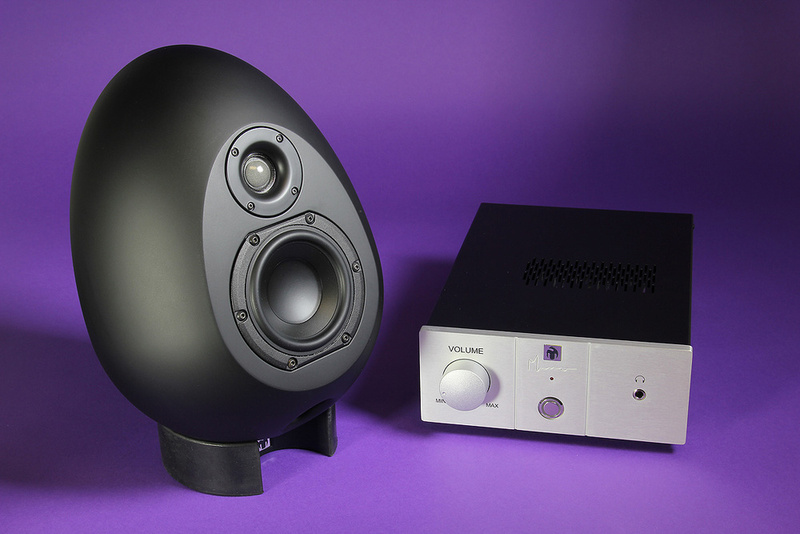 Apparently this version of the Egg is designed to be mounted on consoles or flat desks, which is why the low-end frequency response has been made continuously adjustable so that the bass response can be tailored to compensate for the boundary loading that occurs when speakers are used close to a rigid surface. Furthermore, the bass port is angled downwards and set low to minimise phase errors — the closer the LF source to the boundary (desktop), the better in this respect. The supplied amp pack connects to the speakers via a pair of Speakon sockets.As with the Egg 150s, an included, adjustable-tilt base allows the speakers to be aimed correctly both horizontally and vertically, though the design is quite different in this case: the base is simply a heavy chunk of moulded rubber, shaped so that the ‘egg’ can sit in it at any desired angle, while a cutaway at the front ensures the bass port is not obscured. It is thick enough and heavy enough to provide some useful isolation as well as support, and holds the speakers very securely. Most practical! I did some listening tests and made comparisons with a few other speakers that I respect, and I have to conclude that the Egg 100s hold their own against anything else in the same price range. They can play louder than you’d probably ever need them to in a nearfield setup, and they stay clean up to surprisingly high volumes, given the small drivers. The bass extension (a 60Hz to 20KHz, -3dB response is specified, and the port is tuned to 70Hz) is impressive, with greater ‘tightness’ and control than you might expect from a small speaker. Equally, the mids and highs come across as detailed yet smooth, with little evidence of ‘reediness’ from the tweeter (something I’ve noticed that can afflict some other mid-priced soft-dome designs). Voices sound well-balanced and natural, which is always a good indication. Imaging is solid, with stable centre ‘phantom’ placement and a convincing sense of depth as well as width, but equally, the ‘sweet’ listening zone is very wide so you don’t have to sit in exactly the right place to hear an accurate rendition of your mix. Despite these being passive powered speakers rather than active ones, I found their sound to be largely consistent with that of the larger Egg 150s, though their compact format makes them better suited to mixing in smaller rooms or on desktop setups. I confirmed that I could work with them for long periods without the sound becoming fatiguing, yet they are very revealing of flawed material, which is just as it should be. Good mixes sound great, bad ones still sound bad. While not exactly cheap (they are about two-thirds of the price of Munro Sonic’s larger Egg 150 speakers), given the quality on offer, the price is not unreasonable. As long as you don’t need to use the tops of your monitors as shelves for storing other items, these should fit the bill very nicely indeed. There are many other brands vying for your cash within this price bracket, though most of the Eggs’ rivals are conventionally shaped, and some have larger drivers. Obvious competition comes from PMC, Genelec, Dynaudio, Focal, Adam, Eve, Neumann and Event, with numerous lower-cost options available from companies such as Mackie, PreSonus, Tannoy, KRK, Fostex and Alesis. Excellent bass extension for such a small driver. They can still seem expensive when compared with other respectable four- and five-inch active monitors. The Egg 100s deliver a high level of accuracy at adequate levels for nearfield listening. £1299 per pair including VAT.